Former England midfielder Paul Gascoigne says he is "back on track" after suffering "one blip" in his struggle with alcoholism. The 48-year-old was pictured with cuts to his face and being accompanied by a police officer on Sunday. "I'm not perfect and don't want to be either but I am trying my best always," he said on Facebook. In June, Gascoigne said he was glad when told at the age of 33 he was an alcoholic. The former Newcastle, Tottenham and Rangers player, known to fans as Gazza, was not admitted to hospital or rehab according to his management company. He added: "Thanks so much for all your support. You would think they would leave me alone but it is good sometimes being famous. "I've done really well for 11 months. I have one blip and I get hammered for it. I am back on track now." 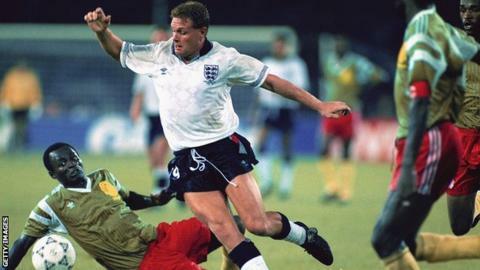 Gascoigne played 57 times for England and was an integral part of the team that reached the semi-finals of the World Cup in 1990.